(SVZ) immediately surrounding the lumen of the neural tube migrate to their final destinations and give rise to the enormously diverse range of neurones and glia found in the adult brain (Figure 7.2). Figure 7.2 Radial glial cells form a scaffold that assists neuronal migration in the developing nervous system. 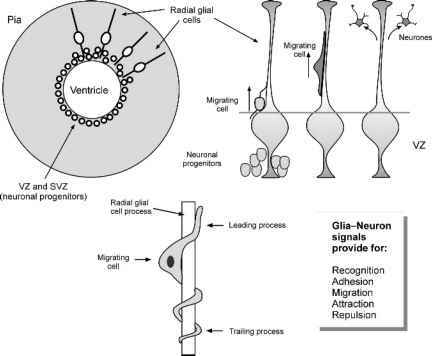 Radial glial cells extend their processes from the ventricular zone (VZ) and subventricular zone (SVZ), where neural progenitors reside, towards the pia. Neuronal precursors attach to the radial glial cells and migrate along their processes towards their final destination. Numerous reciprocal factors released by both neurones and glia regulate the processes of mutual recognition, attraction, adhesion, migration and final repulsion and diffusible and extracellular matrix molecules. Although the specific signals are not fully resolved, they include laminin-integrin interactions and neuregulin, which is expressed by migrating neurones and interacts with glial ErbB receptors. Subsequently, foetal radial glia disappear and transform into astrocytes; remnants of radial glia persist in the adult brain where they can generate olfactory and hippocampal neurones. 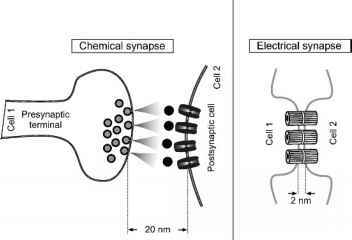 After neurones reach their final sites, they extend axons, which in some cases grow for considerable distances and have to cross the brain midline (decussate) to reach their synaptic targets. Channels formed by astrocytes provide a mechanical and guidance substrate for axon growth. In the corpus callosum, for example, astrocytes form a bridge (the glial sling) that connects left and right sides of the developing telencephalon. The ability of astrocytes to support axon growth decreases with age; embryonic astrocytes strongly support axon growth, whereas mature astrocytes inhibit axon growth - hence, the astroglial scar that forms following damage to the adult CNS is a major barrier to axon regeneration. Astrocytes produce a number of membrane bound and extracellular matrix molecules that serve as molecular cues for axon growth. These are generally considered to act by activating receptors on axonal growth cones to regulate process outgrowth; for example, N-cadherins and fibroblast growth factor receptors mediate neurite outgrowth by increased intracellular calcium in the growth cone. Astroglial laminin-1 is an excellent growth substrate for axons, and decussation of axons at the optic chiasm is dependent on laminin-1 and chondroitin sulphate proteoglycans produced at the glial boundary. Growth inhibitory molecules such as sempaphorins and ephrins also play important roles as guidance cues by regulating growth cone collapse.